This decidedly not-for-kids illustrated A–Z, celebrates the many faces and facets of David Bowie. 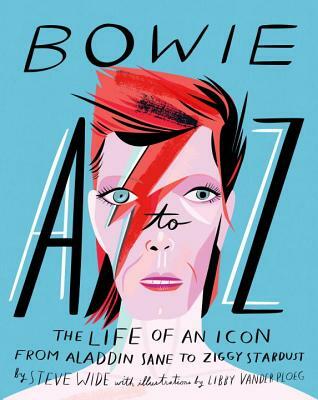 From Aladdin Sane to Ziggy Stardust, Bowie A–Z is densely packed with everything you need to know about the rock legend – from the greatest hits of trivia to the most obscure B-side facts. Bowie’s extraordinary cultural significance was highlighted by the worldwide outpouring of love following his tragic passing in January 2016. A huge influential source to many in the fields of music, art and fashion, David Bowie towers as a cultural figure of the twentieth (and into the twenty-first) century. Celebrate his enormous life in this fun, pop-cultural book. Steve Wide is a DJ and writer. He has run some of the most enduring indie and retro club nights in Melbourne, and DJ’d for international acts including Primal Scream, Happy Mondays, The Shamen, Saint Etienne and Stone Roses as well as interviewing Jarvis Cocker and Noel Gallagher in front of festival crowds. He has interviewed countless UK music artists from John Lydon to Johnny Marr and comedians Bill Bailey, Noel Fielding and Russell Brand. He also has a fish called Ziggy Stardust.